From September 29th to October 4th, my wife Kit and I were treated to a visit to Malaysia by the kind folks at Sky Thomas Food Industries Sdn Bhd, makers of MyKuali Penang White Curry Noodles. 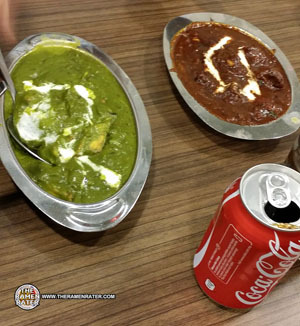 The purpose of the trip was not to promote for them, but to show us the foods of Penang. Here is the first day of the trip! 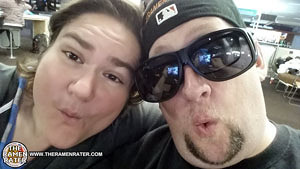 We left our place in Lynnwood, Washington to go to Seattle Tacoma Int’l airport around 9pm. Our flight didn’t leave until 2am, but we had to get there, check our bags, go through security, etc. We ended up with a bit of time to kill so we explored a bit and waited. On the plane (actually, we followed George Carlin’s advice and got IN the plane). 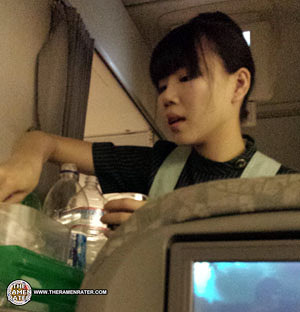 The carrier was EVA airlines. 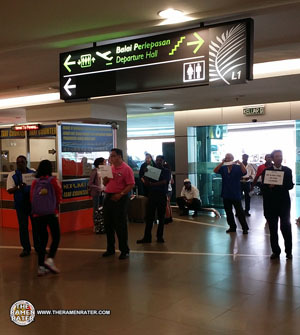 We have two transfers – one to Singapore and then to Penang. The flight was going to be over 12 hours – a lot of sitting, but since we’d been up at around 8am, we figured we’d sleep quite a bit. Adrenaline from the excitement made that a little tough though. 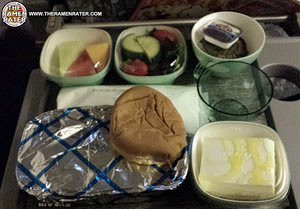 We got two meals on the flight – the first was pretty quick after departure. The meals were actually pretty good – this one was chicken with mashed potatoes and veggies with a little bun, butter, small salad, fresh fruit and a little cake. Let me introduce you to my little friend – the remote. That screen with the map was a touchscreen and this remote worked it as well. 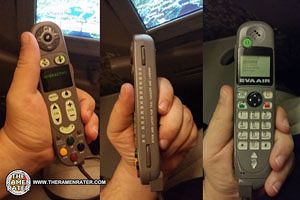 What was a trip was it doubled as a phone you could use to make in-flight calls. 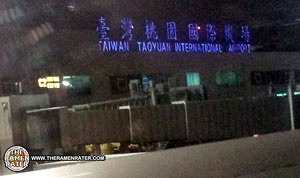 After flying by Alaska, the Sea of Okhotsk (a place I found fascinating by name as a child) and over Japan, we were in Taiwan! I felt like Frodo (or was it Samwise) from Lord Of The Rings when he said ‘this is the farthest I ever been from the Shire. 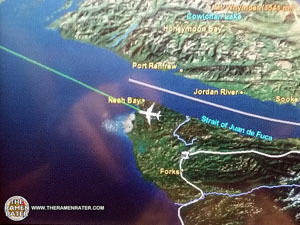 One thing that was weird was that during the flight, we crossed the dateline. 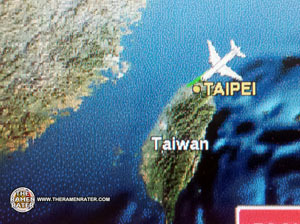 Taipei is 15 hours ahead of our timezone. It got dark here around 7pm, and we were ahead of the sun for the whole flight, so we had around 18 hours of darkness – really messes with your brain. Here I am in Taipei! 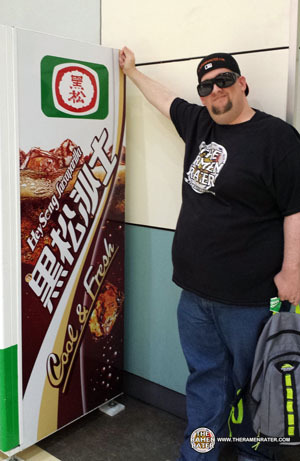 They have lots of these HeySong Sarsparilla vending machines there – which is my son’s favorite drink! 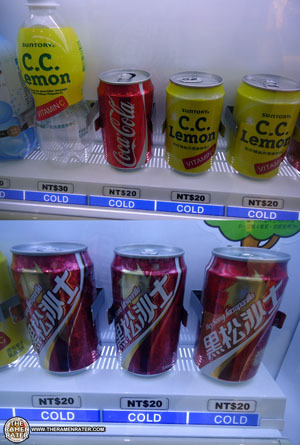 So $50USD is about 1000NTD, so a soda is a buck. 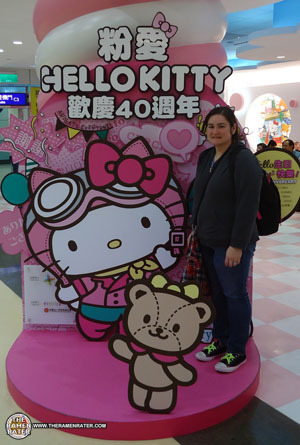 My wife Kit was so stoked – she’s a Hello Kitty aficionado and they have a big Hello Kitty store there – as well as a gate that is Hello Kitty themed for the Hello Kitty plane. Unfortunately, we didn’t get to fly on one of those, but this was pretty awesome! We next boarded another EVA flight for Singapore. Here’s the only pic I took in Singapore. 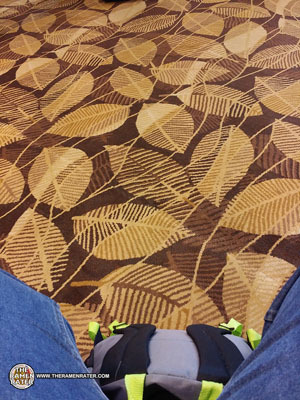 It was a very busy airport and we found we had to go to this place, then that place and spent a good amount of time speedwalking on travelators – that’s what the horizontal conveyor belt walkways are called. We’d planned on doing a little shopping here, but literally bolted through everything in perfect time to be a minute or so early for boarding. Then we got on a SilkAir flight to Penang. 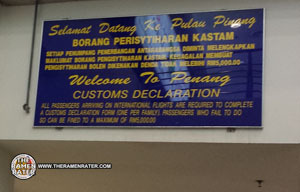 We have arrived in Penang! Wow! We emptied out of the arrival hall into this area with all these guys with signs – most of them were taxi drivers waiting to take people to their final destinations. Many were for big tech companies like Western Digital, Intel, and more. 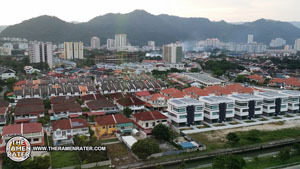 Our first impression of Penang was all about heat and humidity – like walking into a bathroom where someone just took a shower – steamy! We got a hold of our hosts Annie and Thomas and soon we were off for a first meal in Penang! 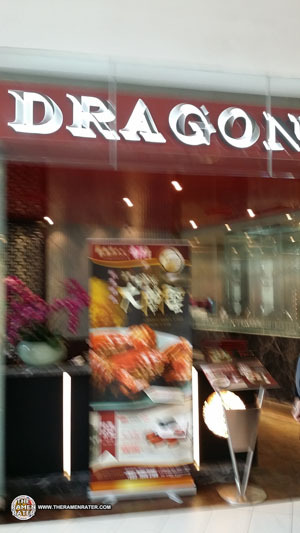 The first place we went to was Dragon-I at Gurney Plaza. They serve ‘Shanghainese’ delights of all kinds! The first thing we tried were boiled peanuts – pretty neat little appetizer. Then we watched the chef hand pull noodles and make us bowls of soup! Kit had pork dumpling soup and I had spicy braised beef – excellent! We also tried a noodle soup that was augmented with Century Egg – an aged egg that’s been marinated in different ingredients. It was good! I regret not taking lots of pictures here – it was excellent! We next got to spend an hour or so to rest before dinner after checking into our room at the Eastin Penang hotel. This is the view out the window. We next went to a resort where I did a quick interview with a local magazine and photoshoot. Then off to dinner! Dinner was at the new Sri Ananda on Macallister. It was a big and busy place. so hot and humid outside and we hadn’t acclimated to the climate so we all ate inside. 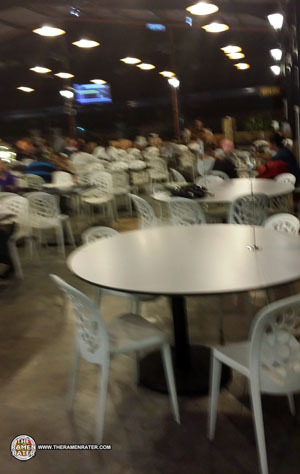 One thing to know is that in Penang, most restaurants seem to be outside or very open. We dined with Annie and Thomas who are brother and sister and both work at Sky thomas Foods as well as their parents (the masters of curry)! 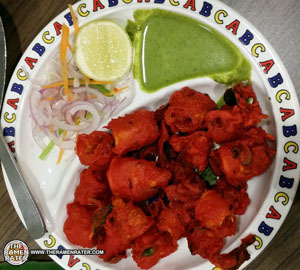 This place has wonderful Indian food! 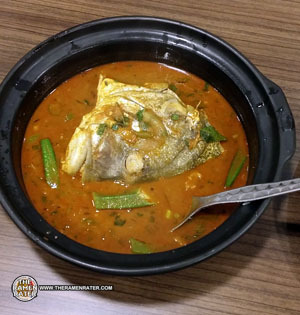 Here is their Fish Head Curry. Cheese curry on the left and I believe lamb shank curry on the right. 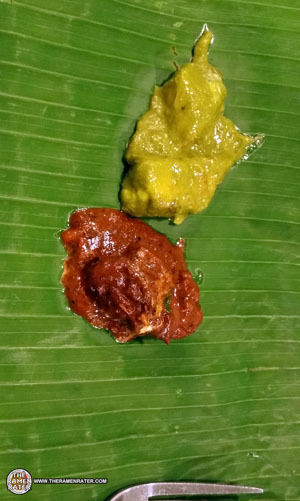 You don’t use a dish here; you get a huge piece of banana leaf like a placemat and eat everything off of it! Plus, you get to use your hands a lot – was fun and very colorful. Can’t remember exactly what this was – but everything was wonderful. 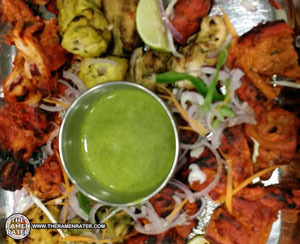 Another dish (not pictured) was a thin and chewy flatbread that was pulled and served with a really nice masala. 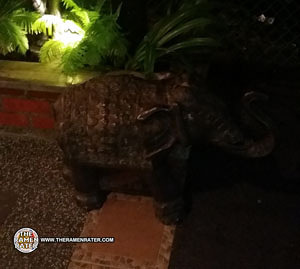 As we left, we were bid farewell by this little elephant statue. Our long, long day was over – I think we’d been up for 35+ hours, and it was time to hit the sack and rest up for tomorrow. 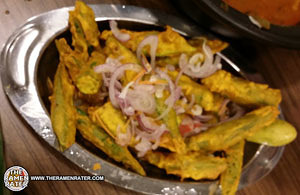 This entry was posted in * News / Noodle News, Malaysia, MyKuali / Sky Thomas Foods and tagged adventure, curry, dragon-i, eva, georgetown, malaysia, malaysia trip, mykuali, penang, penang food, pg, silkair, sky Thomas Food Industries Sdn Bhd, travel, trip on October 6, 2014 by Hans "The Ramen Rater" Lienesch.